Did you use canned beans this time? The selection of beans has gotten broader in stores, I’ve noticed, especially stores with a large Mexican food section. Which ones do you pick? 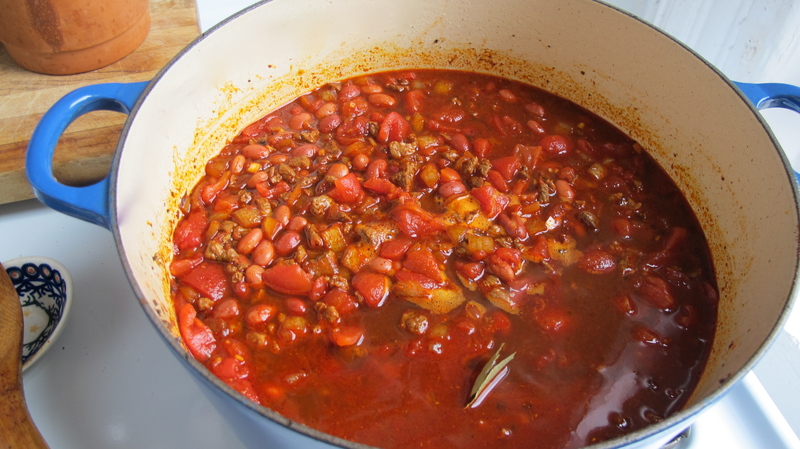 I usually go for a mix of beans when I make chili—for texture/color—but pick at random, usually heavy on the red kidney beans (never black beans except in smoked turkey chili… Or should I say smoked turkey spicy bean soup). I did use canned small red beans this time (which may just be light red kidney beans). I sometimes find regular red kidney beans to have a tougher skin than I want, although they are good and make a nice textural contrast. I like pink beans, red beans, and I think borlotti, great northern, navy, cannellini, and even some roman or cranberry beans would be good. Like you said, I never put black beans in this chili, although I love them for other things. Wow! 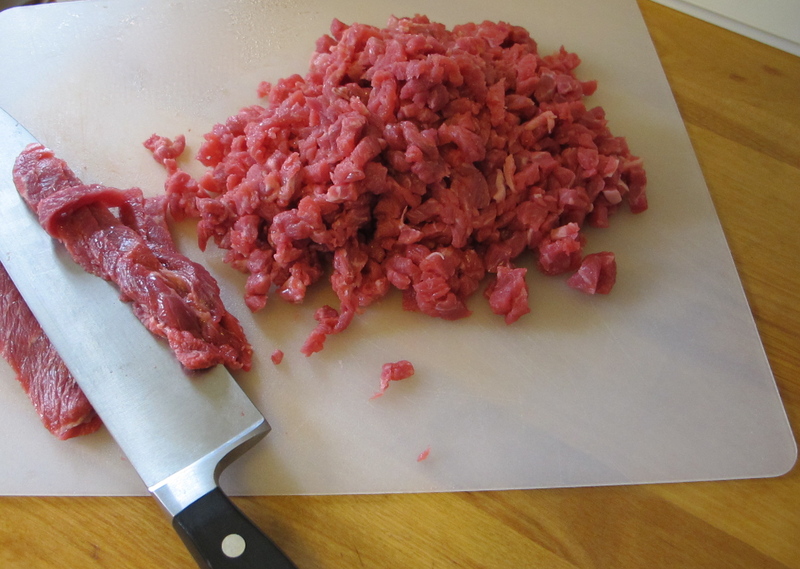 I loved this post… I must try this with Seth’s venison. I’d love to hear how that turns out! If you make it with venison, be extra careful to keep the heat low. Venison is lean so it doesn’t have as much grace period between cooked and dry and higher heat will squeeze the liquid out of it. So, very low simmer will be the key. 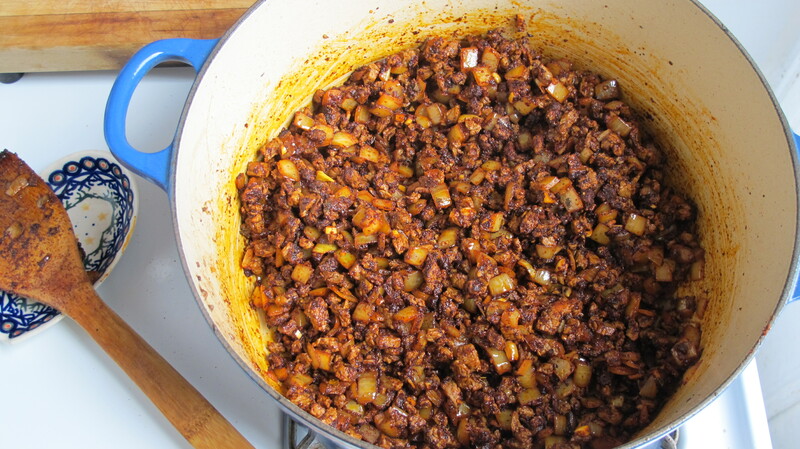 This looks like good chili… I suppose I make mine more like beef stew, very chunky, with the beans cooked separately so I can get them done right. 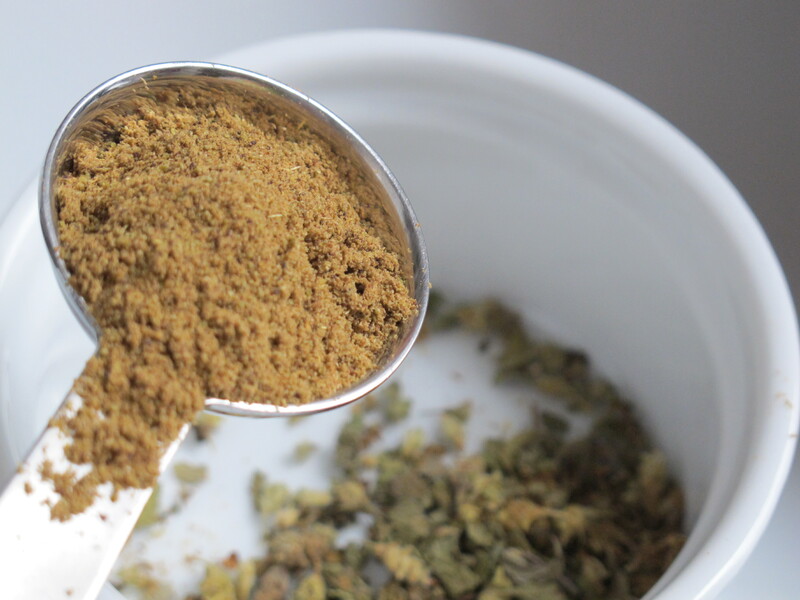 Have you ever tried soaking the chiles and pureeing them instead of powdering them? David, I don’t know if you remember my posole post from last year, but the soaking and pureeing technique is the one I use for that as well as when I make enchilada sauce. 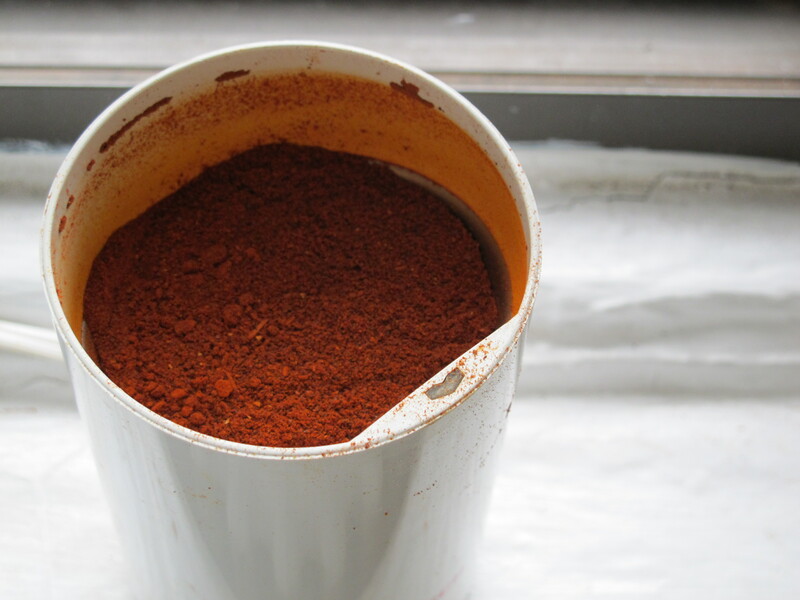 I feel like the ground chili powder adds a certain body and texture that I prefer for chili. Guajillos are tougher than the ancho combination I use for chili and they usually do better when soaked, because then you can get the skin out. As usual your photos are gorgeous. I want to be more careful when I make chili and it might taste better. What chilis should I grow when I get my spring garden? Thanks! 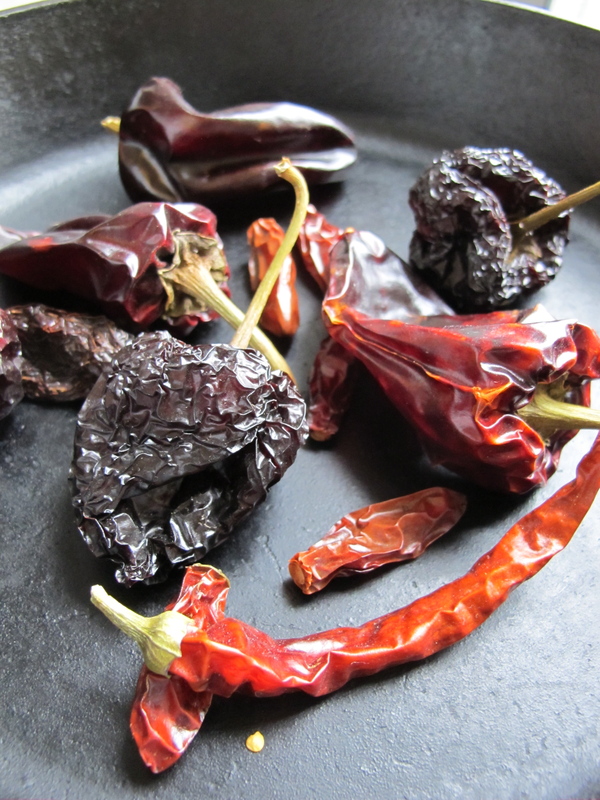 Two of my favorite chiles to grow are the poblanos (which dry to become ancho) and the serranos. They are equally good dry or fresh, which is nice when they all come in at once and you can’t use them up- string them up or lay them in a dry spot and they will redden and dry for Winter use.